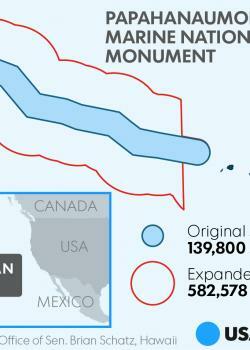 President Barack Obama on Friday expanded a national monument off the coast of Hawaii, creating a safe zone for tuna, sea turtles and thousands of other species in what will be the world's largest marine protected area. The president is slated to travel to the monument this week to mark the new designation and cite the need to protect public lands and waters from climate change. The president was born in Hawaii and spent much of his childhood there. The regional council that manages U.S. waters in the Pacific Islands voiced disappointment with Obama's decision, saying it “serves a political legacy” rather than a conservation benefit. Sean Martin, the president of the Hawaii Longline Association, said his organisation was disappointed Obama closed an area nearly the size of Alaska without a public process. “This action will forever prohibit American fishermen from accessing those American waters. Quite a legacy indeed,” he said in an email to The Associated Press. “By expanding the monument, President Obama has increased protections for one of the most biologically and culturally significant places on the planet” said Joshua S. Reichert, an executive vice president at Pew. The White House said the expansion is a response to a proposal from Democratic Sen. Brian Schatz and prominent Native Hawaiian leaders. The federal government will also give Hawaii's Department of Natural Resources and Office of Hawaiian Affairs a greater role in managing the monument, an arrangement requested by Schatz and Governor David Ige. “Our local fishing industry, which comprises more than 80 percent of the local economy, depends heavily on access to these waters,” Amata said.